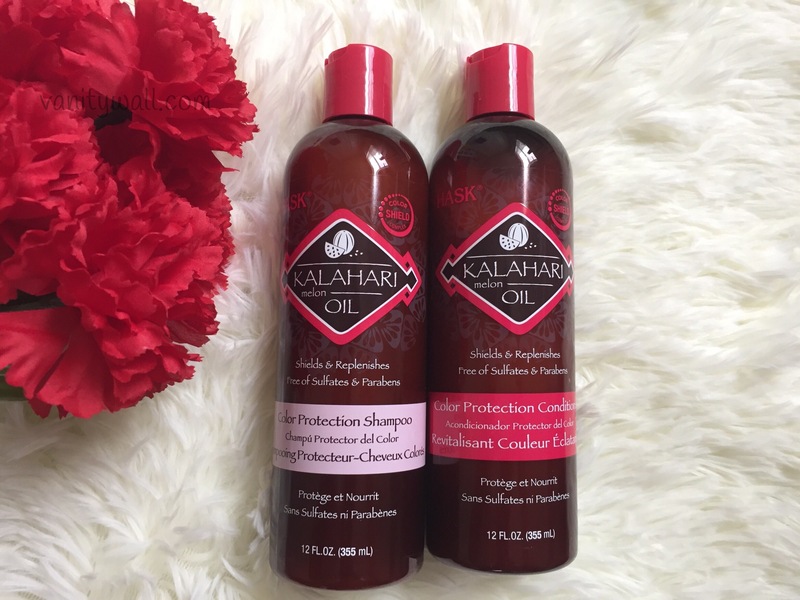 Today I am reviewing the Hask Kalahari Melon Oil Hair Color Protection collection which includes shampoo, conditioner, deep conditioner and a shine hair oil. 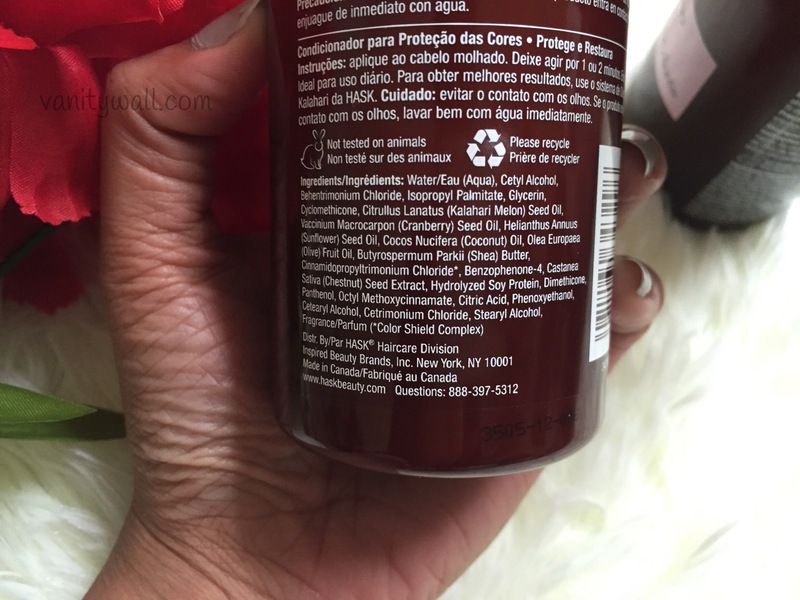 I have color treated hair so I am always on the lookout for hair care products that are created for color protection in addition to catering to the generic hair issues. I absolutely love Loreal’s EverPure Color Care Volume range which works brilliantly for my hair. Since I don’t like my hair to get used to one product/brand indefinitely, I try to switch my shampoo and conditioner every 3-4 months. If you have read my post on the Body shop duo, then you would know the balance shampoo just wrecked my hair so this range from Hask landed in my hands at the right time. Directions Apply to wet hair. Massage into a lather, rinse thoroughly and repeat if desired. Ideal for daily use. Preserve and nurture color treated hair with HASK Kalahari Melon Oil Color Protection Conditioner. Found in the African desert, Kalahari melon oil is known to thrive and retain moisture in the driest conditions. This natural color-locking, damage-blocking powerhouse ingredient counteracts dry-out and fading, leaving hair nourished and shiny. With Color Shield Complex, cranberry and sunflower oils, this conditioner softens, detangles and helps maintain long-lasting vibrant color. Directions Apply to wet hair. Leave on for 1-2 minutes. Rinse thoroughly. Ideal for daily use. Directions Apply a generous amount of deep conditioner to clean, wet hair. Massage into hair focusing on damaged areas. Leave on for 10 minutes. Rinse well. Style as usual. Ideal for use 1-2 times per week, or as needed. Directions: Can be used on both wet and dry hair to create a silky, smooth finish. Distribute a coin-sized amount evenly throughout hair, avoiding the root area. Apply more as needed. 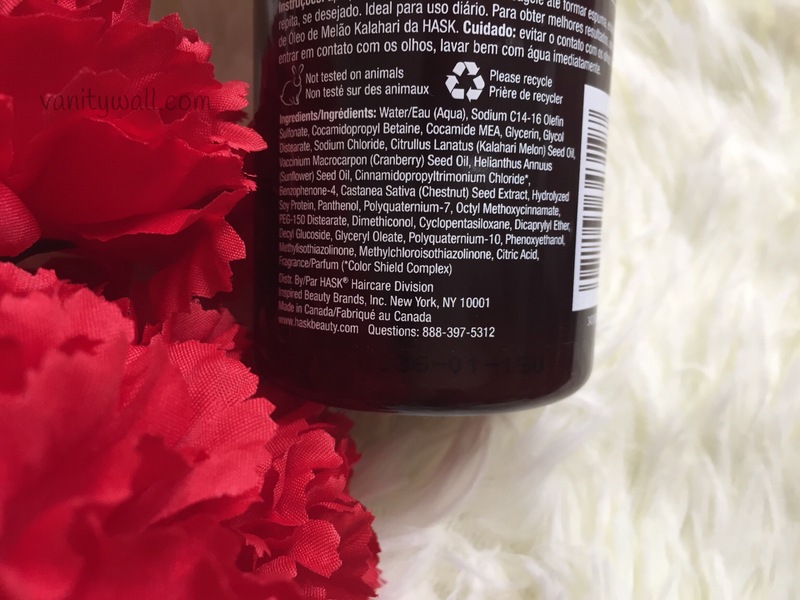 Water/Aqua, Cetearyl Alcohol, Cetrimonium Chloride, Quaternium-18, Citrullus Landaus (Kalahari Melon) Seed Oil, Helianthus Annulus (Sunflower) Seed Oil, Vaccinium (No Suggestions) (Cranberry) Seed Oil, Cinnamidopropyltrimonium Chloride*, Hydrolyzed Collagen, Tetrasodium EDTA, Isopropyl Palpitate, Sodium PCA, Tocopherol, Panthenyl (No Suggestions) (No Suggestions) Chloride, Glycerin, Citric Acid, DMDM Hydration, Fragrance/Perfume (*Color Shield Complex). Cyclopentasiloxane, Dimethiconol, Citrullus lanatus (kalahari melon) seed oil, Helianthus annuus (sunflower) seed oil, Vaccinium macrocarpon (cranberry) seed oil, Benzophenone-3, Tocopherol, Fragrance/Parfum (Fragancia). The Hask Kalahari Melon Oil Color Protection Shampoo comes in a tinted sturdy plastic bottle. The shampoo has a nice moderately thin texture without being runny that spreads easily onto the scalp and hair. It appears pearlescent white and smells absolutely great – just like a plate of sliced watermelon. The entire Hask hair care line is sulphate (SLS) free but imagine my surprise when this shampoo lathered brilliantly. Just spread it onto wet scalp and hair and work your fingers through it to form ginormous amount of suds. It cleans the hair really well without drying it. The formula is excellent and will work for all types of hair. This is formulated specifically for color treated hair but at the same time deals with oily scalp and dull limp hair. Even though it’s not a volumizing shampoo, it does add adequate volume to the hair. I have used this shampoo with the Melon oil conditioner as well as the body shop volume conditioner. The latter makes an excellent duo too. The Hask Kalahari Melon Oil Color Protection Conditioner comes in a tinted sturdy plastic bottle. The conditioner has a thick creamy consistency that works will with wet hair. It spreads easily onto the hair. As the directions don’t mention anything about applying to the roots or scalp for that matter, I make it a point to start about an inch from the roots and spread uniformly to the ends. Unlike some conditioners that need bucket loads of water to be cleaned up from the hair, this conditioner works like a breeze. It doesn’t get stuck on the hair and is easy to wash away. Just like the shampoo, this conditioner smells like watermelons. This conditioner adds ample softness and makes the hair really smooth. It is hydrating without being heavy. It adds so much vibrancy to the hair and intensifies the hair color. I had friends asking me if I got a hair color/treatment done since my hair is shining so much. I love this shampoo & conditioner duo. The Hask Kalahari Melon Oil Color Protection Deep Conditioner has a very thick creamy consistency slightly thicker than the conditioner. It works well in distributing evenly onto wet hair. Personally I didn’t find this deep conditioner to be deep conditioning. I feel the results are almost similar to what you get with the conditioner. It didn’t feel overly conditioning on my fine/thin hair so I don’t think it is going to show any results for normal to thick hair either. Not recommended. The Hask Kalahari Melon Oil Color Protection Shine Oil comes in a tiny slender tinted vial with a rubber cap. It is not the most convenient packaging as the rubber cap is a bit flimsy. I would have preferred a small pump dispenser. The oil is lightweight but has thick consistency. You just need a small pea sized amount to distribute evenly all over medium length hair. It adds a soft healthy sheen to the hair and smells like the other products from this range – watermelons. I like to use it on both dry and wet hair. On dry second day hair, it looks lovely. You can use it to add some life to the hair once you use a dry shampoo. I use it on wet hair post shampoo+ conditioner and it just makes the hair color so much vibrant. Overall Hask Kalahari Melon Oil Color Protection collection is a must have/try for those with color treated hair. 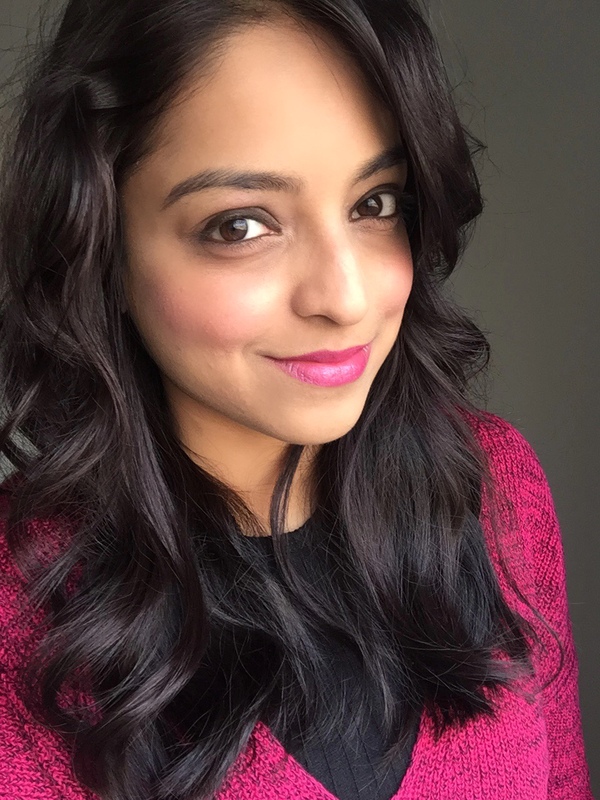 I had colored my hair about 7 months back and am very much due for a new appointment. Including the Hask Melon Oil collection to my regimen about a month and half back has just enhanced the existing hair color. To find hair products that suit my hair type (fine hair – oily scalp) is a pain. Hask Melon Oil collection has just become one of my top favorite hair products. Highly recommended! If you have color treated hair, then go ahead and buy the shampoo, conditioner and shine oil which will set you back by $15!!!! That’s it. It not only enhances the hair color, but is hydrating, volumizing and rids off oiliness. It is definitely a multi-tasking hair care range.